Every action has a reaction. Even though as an artist, I may initiate an action, both the viewer and I participate in understanding the reaction. I react to each mark I place on a surface and the viewer reacts to each mark that is ends up on a board. I don’t begin with an outcome in mind. I lay down a line and then react to it. I encounter each print one step at a time. There is an intangible energy to each work I create that is defined by the materials I am working with. My creations are based on my reactions to the environment around me. 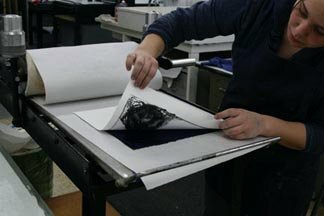 Intaglio plates allow me to create different dimensions by stacking plates on top of each other. My work consists of process and technique There are many steps involved to achieve the end result. Printmaking requires much planning and experience.